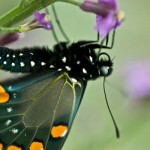 At the top of the chrysalis for the pipevine swallowtail butterfly there are patterns that mimic eyes, nose and ears. The string around the neck is woven by the caterpillar before it changes into this shape. 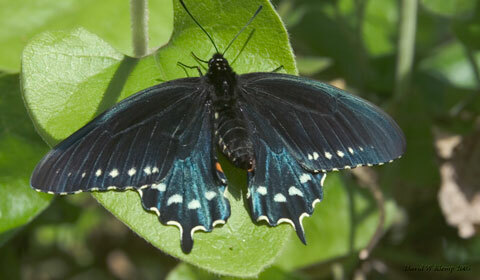 This afternoon I released two pipevine swallowtail butterflies from their rearing cages. I place one on a plant, went off to observe a Monarch caterpillar, and came back 10 minutes later to see a male (smaller of the two, probably cruising the yard looking to score) connected to the female (on top). At sunset, several hours later, they were still there. The females abdomen seemed to pulse, and the male was getting noticeably thinner, as if she were sucking fluids out of him. The observation and care of the California Pipevine Swallowtail Butterfly has been on-going since 1911 with the mother of Louise Hallberg in Sebastapol. My dear friend and butterfly mentor, Barbara Deutsch, has extended the corridor to San Francisco. My family has introduced this on-going process to Santa Cruz County for more than the last decade. Three years ago I asked Master Gardener’s guidance and assistance. In exchange for Community Credit hours towards the Master Gardeners certificate and 2 plants for their private garden, interested volunteers would take responsibility for the planting of some public area such as county and state parks, cemetaries, schools, museums, or organizing their neighborhoods of 8-15 participants. The idea being that on a very limited budget, to include a maximum number in interested people who would be enthusiastic about the project, talk about it with friends and allow the project to grow virally, as it is referred to on the internet. To this end Randa Solick and I applied for a small grant which is being held for use in an account by the Master Gardeners and used to supply plants for the project. The plants are propagated for the most part by Kathy Navarez at Cabrillo Horticulture and available for the project as well as the public at Cabrillo College. The plants are being cloned from plants in Martha’s garden. Martha has acquired plants of the California Pipevine from Rancho Santa Ana Botanic Garden in the south to Boonville in the north collecting plants from as many parts of California as she could find hoping to attain some level of plant diversity. Helen Englesberg, propagator at UCSC Botanic Garden has made some plants propagated by seed to the public upon occasion as well. 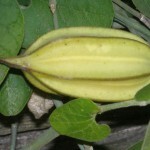 Some of the native plant nurseries have their own mother plant of Pipevine and occasionally plants have been available at different commercial native plant nurseries as well. The plants take a bit of effort but are easy to do according to Ken Montgomery former director of the Mendocino Botanic garden. According to Montgomery, you take stout cuttings in mid October, prepare them in deep pots, provide them 75 degree bottom heat and mist twice a day. They do not necessarily need a green house. Contrary to the experience of some propagators, Kathy has virtually 100% success rate. One local gardener indicated that he did well even without using bottom heat. Six months later they can be transplanted to a permanent location. Transplanting this baby has a couple quirks in order to be successful. Dig and water your hole and have mulch (wood chips work well) ready. When taking the plant from the original gallon container, it is very important that the roots are not disturbed! This is unlike many other plants where you need to cut or pull or separate the roots. Cover the young plant and mulch it heavily. Depending upon the soil moisture, sun/shade heat, wind, etc. conditions, water as your plant needs it, usually once every 3-4 weeks during the non-rainy season. Just keep you eye on your plant to see what it requires. This extra care is necessary for 1-3 years, generally 2 years. After it is established, it doesn’t need special attention. On my property I’ve planted in clay, sandy soil, unamended as well as heavily amended soil, in shade and semi-shade and sun. It grows faster or slower, putting out more or less shoots and leaves that are bigger or smaller depending upon its location. To be hospitable for the butterfly, we’ve observed here on the coast that the butterflies will come to your plant with sun between 10AM until 4-5PM. The females seem to prefer laying eggs on the under side of the leaf or stem. 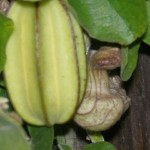 If it is windy or slightly inclement, they will lay them on the underside of stems that are virtually in the duff. Some of our plant runners trail on the ground and some climb a nearby structure for verticality. In the fall we throw a bit of soil or compost on the ground plants as they will air layer over the winter thus creating a more robust plant area. We not used gopher baskets (that doesn’t mean anything, but after air layering, it becomes a mute point. Occasionally in the very early spring we’ve seen deer nibble a couple leaves, but the minute anything else is producing, the foul tasting Aristolochia is ignored. Some winters are harder on the plant than others. If it is very cold the leaves will turn brown or even fall off and the vine looks unattractive until spring brings new foliage and flowers. 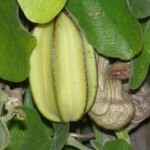 We’ve seen “native” stands of Aristolochia in a few places. They seem to like dappled sun under trees (mostly oaks) and mixed in with other plants—grasses, poison oak, elderberry bushes. 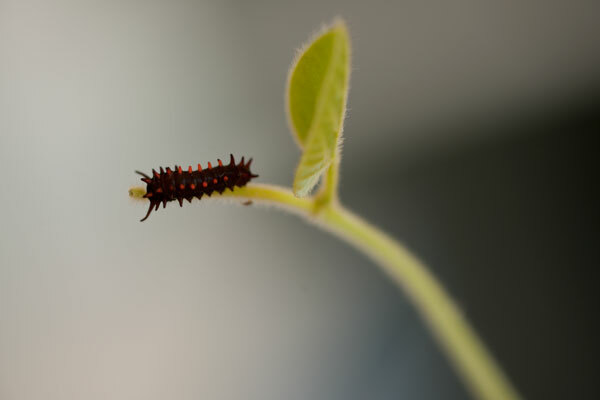 The caterpillars use the grasses and stems to quietly go into instar before returning to eat the Pipevine after shedding their old smaller exterior and growing a new larger one. The Pipevine does this about 6 times before going into chrysalis. It stays in chrysalis a few weeks coming out to have 2 or 3 flights in a season or it usually stays in chrysalis until the following spring. In one case at Louise Hallberg’s, one chrysalis remained viable and came out 7 years later. Why? No one yet has an answer for this. The butterflies are not endangered and there are more than one species in the country. 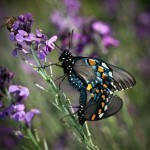 Here on the California coast the butterflies do not migrate. The same Pipevine in Sacramento or Texas migrates. 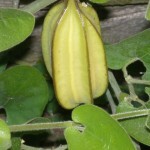 It was stated at a talk at the UCSC Arboretum in the 1990’s by local butterfly expert, Randy Morgan, that the butterfly belongs here, its pupating plant, the Aristolochia californica or Dutchman’s Pipevine, is listed in the Jepson’s 1861 Flora of the Santa Cruz Mountains, but has not been sighted here (now) for 100 years. The speculation was the plant a painfully slow grower has been removed with development. That statement is the one that caught my attention. Perhaps what some people inadvertently eliminated, others can replace. I talked to Barbara Deutsch about my idea. She told me where to get the first plants. Once established, I got permission from some members of a California Native Indian tribe to collect caterpillars on their reservation. 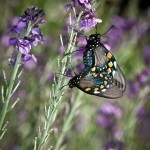 These were brought to Santa Cruz and my family became (along with a lot of hilarity and disbelief) butterfly midwives! NOTE: It is advised that you park outside the gate in the Park and Ride area and walk in. 2 HOLLINS DR is on the RIGHT. If you reach S CIRCLE DR you’ve gone a little too far. The count of pipevine swallowtail butterfly caterpillars that I have gathered in the yard is up to 18. 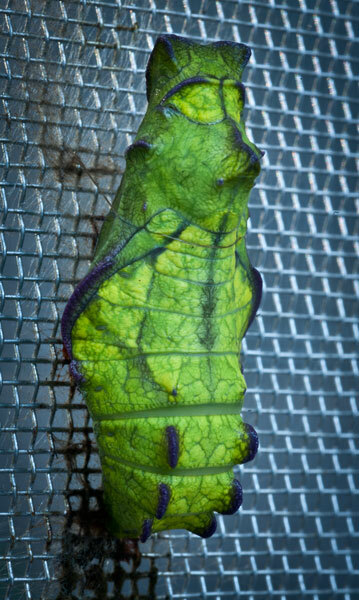 Several in the rearing cage are approaching maximum size – I expect to see them transform to chrysalis soon. Wandering the yard I found a few more pipevine swallowtail caterpillars of medium size bringing the count of live “piggles” that we have found in the yard to 15. These beasties are happily munching away in one of our rearing cages. On two separate aristolochia branches I also found 33 eggs. They have been put in a special rearing cage until they hatch. In spite of poor weather, and no pipevine swallotails visible in the yard, some female stopped by to lay eggs a few weeks ago. 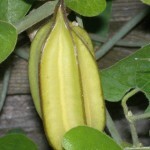 I was surprised one morning to see a cluster of small caterpillars on our main mother plant (aristolochia californica). I picked 12 and have them in special raising boxes. This critter is about 3/8" long. 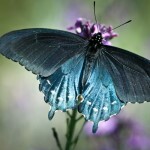 This blog is dedicated to the discussion of butterfly survival. As an example we have established locally (Santa Cruz County, California) a project to restore a native butterfly that has not been seen in the area for almost a century. We appreciate comments. However, this blog will be started as a moderated blog so that we can protect ourselves from that evil bug – SPAM. Again, all comments are greatly appreciated.